iting your potential. Read books and take classes that provide you with the knowledge and support to accomplish goals and feel better about yourself. The key is committing to never-ending improvement. Adversity naturally sounds like a bad thing, but an opportunity to overcome a difficult situation can actually be a valuable gift, say experts. “Times of adversity are simply stepping-stones to live a better life,” says Coach Michael Taylor, author of the new book, “Adversity is Your Greatest Ally.” “They’re neither good nor bad until you choose to label them.” Born in the projects, a victim of child abuse and a high school dropout, Taylor was well-acquainted with hardship in childhood, and has been no stranger to it in adulthood. His new book details his journey to success and happiness, offering advice to others seeking to do the same. While Taylor cites success stories of notable scientists, artists and entertainers like Albert Einstein, Jay Z and Oprah Winfrey as examples of those who surmounted life’s hurdles, he firmly believes that anyone with the right attitude and habits can make an upward leap. Here, Taylor offers five keys he says are needed to overcome adversity. • You must develop a positive attitude: If you’re truly committed to turning your adversities into allies, it is necessary to develop a positive attitude. A negative attitude makes life’s challenges more difficult to overcome. • You must discover your unique gifts: Everyone has special gifts and talents. When expressed, you will find your true purpose in life. If you’ve forgotten what yours are or have given up on sharing them with the world, rest assured they are within you. Gifts are not necessarily something you do; they are primarily about who you are. For example, being loving and caring is a gift. Being intelligent and analytical is also a gift. For more tips and information about the book, visit AdversityisYourGreatestAlly.com. With patience and persistence, you can turn the page on a challenging chapter in your life and write your own story. Most Americans understand the importance of including a variety of fruits and vegetables into their diets, but finding inspiration and fresh ideas for incorporating them into everyday meals can be challenging. Research shows that only 10 percent of Americans are meeting the MyPlate recommendations for daily intake of fruits and veggies, according to the Centers for Disease Control and Prevention. As a rule of thumb, half the foods you eat for any given meal should be made up of fruits and veggies - preferably ones incorporating a range of different colors and nutrients. Daily meal planning is made easier if you turn to your freezer for a little help. Balancing your plate with frozen meals and pizzas and 1. Chop, eat, repeat. Not into cooking? Simply buy whatever looks good, wash it, cut into slices and enjoy, perhaps dipping it into salad dressing or a yogurt dip. 2. Shop the frozen-food aisle. Delicious and easy-to-prepare frozen foods such as DiGiorno pizzeria! thin Margherita pizza or Lean Cuisine Ricotta Cheese & Spinach Ravioli provide your family plenty of wholesome meals without requiring lengthy prep time. Simply pair with tasty side dishes made with fruits and vegetables for a balanced meal. other tasty ingredients that will motivate you to want more; consider slices of grilled meat or shrimp, boiled eggs, or small amounts of nuts, cheeses, dried fruit, etc. Then divide the mix into individual plastic containers for the week's lunches. 4. Top it off. As soon as your favorite frozen pizza comes out of the oven, boost its nutrient punch by adding pieces of fresh tomato, basil, pineapple, spinach or arugula. beats per minute, for example, will have their heart pump 1610 times a day, or 587,650 times per year. Now multiply that by your age, and you’ll have a good idea of just how hard it’s been working for you, keeping the circulation going, to feed and oxygenate your cells and organs through miles of veins and capillaries. FORECLOSURE if the sign had read “Condemned.” Her construction debut was behind her. She popped a gumdrop in her mouth and headed home to a house that, thankfully, was not made of gingerbread. Jean Mlincek is a freelance writer and resident of St. Petersburg, Fla.
for example, will often respond to a healthy eating regime, with less sweets and carbs rather than relying on a pill so we can eat what we want. If our bones creak, and our joints are stiff, sitting in a chair so we don’t hurt is not the answer. What we need is to move to keep everything going. Personally, for me, this is a big one. Having crippling arthritis history on both sides of my family tree, I’ve had relatives lose their ability to function, so I’m forever pressing on going to the gym to try to stay limber and function independently. The gym has never been a hangout of mine - I still don’t relish it - but after knee and shoulder replacements I’ve come to see the mandatory need for it to keep moving. It’s sad that we must learn these lessons after the the damage is done, but we can still have a life with quality, using what we have that still works to enjoy our time here…even if it means going to the gym. And while we’re at it, thank our hearts for beating for us, and keep doing our part to help it keep on ticking. Join our sales team. For information about opportunities throughout Florida and North America, email tgoldman@amgoldman.com. Jean Mlincek • Carolyn Shockey Robert J. Weinstock • Nick Thomas Eric W. Olsen • Chris Loraine Wells Jay Calahan • Brian James (Author) Marie Moser (Poem) Would you like to write for Senior Voice America? 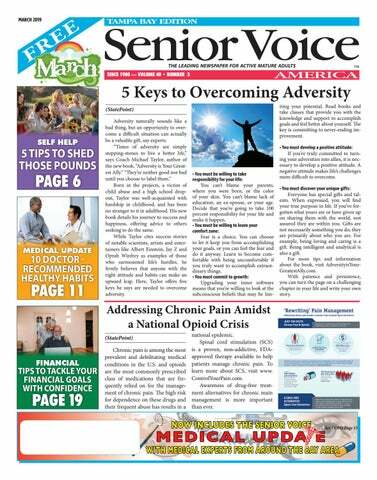 Please email editor@seniorvoiceamerica.com. SENIOR VOICE IS A PROUD MEMBER OF Better Living for Seniors The Guardian Association of Pinellas County The Florida Assisted Living Association Senior Voice America is published monthly and is distributed free of charge, courtesy of its advertisers. Distribution area includes Pinellas, Hillsborough, Pasco, Sarasota and Manatee counties. Articles and advertising contained in this issue do not necessarily reﬂect the opinion or endorsement of the publisher, who does not verify advertiser claims and reserves the right to refuse or discontinue any advertising. DIAGNOSED WITH LUNG CANCER? HAVE YOU CONSIDERED SURGICAL TREATMENT? Cancer treatment decisions deserve second opinions. With over 20 years of experience, Dr. Eric Sommers is nationally recognized for his expertise in minimally invasive video- and robotic-assisted lung and chest surgery, with faster recovery times and world-class outcomes. Recognized for her excellence in critical care, Dr. Mary Vinson specializes in the treatment of lung cancer and lung nodules via robotic surgery. To schedule an appointment, call TGH Thoracic Surgery at (813) 548-5323. (StatePoint) Maybe you want more energy, or perhaps you want to lose weight and keep it off for good. Whatever your goals you can decide that now is the time to make a fresh start to become the best version of yourself. Here are five tips from Nutrisystem experts to get your scale moving in the right direction and support your long-term health. 1. Skip “diet” drinks: Of course, you know not to order the regular cola with your meal, but you figure the lower-calorie diet version is an okay choice. Not necessarily. One recent review of research found that artificial sweeteners often used in diet drinks may not be as beneficial for weight management as intended, and that drinking them regularly may be linked to an increased body mass index. If you want something fizzy, opt for seltzer with lemon or lime. But if you can’t stop dreaming of that diet soda, it doesn’t have to be completely off-limits. Just try to cut back. Moderation is key! Even if you’re tracking your food intake with an app or food journal, overestimating portions can sabotage progress. McCormick’s solution: Measure portions -not forever, but for a while at the start. Doing so will help you get a visual of what portions should actually look like. You may also consider eliminating some of the guesswork with a program, such as Nutrisystem, that offers pre-portioned, nutritionally-balanced meals. 5. Reduce stress: Stress can cause your body to burn calories more slowly, which could lead to weight gain, according to a study. Plus, stress increases hormones that stimulate appetite, and the foods you’ll crave for comfort tend to be high in fat and sugar. Help manage stress with deep breathing, meditation, exercise, hanging out with friends or listening to music. More tips on jump-starting your weight loss goals can be found at nutrisystem.com. 4. Don’t eyeball portions: “The super-sized meals at restaurants have With these tips, you’ll be on the road to realgiven us a skewed view of proper portion size,” istic weight loss achievement and have more ensays registered dietitian for Nutrisystem, Court- ergy for your day-to-day life. ney McCormick. 3. Slow down: It takes 20 minutes for the “I’m full” signals from your stomach to reach your brain. When you inhale your food, it’s much easier to eat more than your body really needs. One review of 23 studies found that fast eaters were about twice as likely to be obese, compared to slow eaters. To help slow down, take smaller bites, chew 10 to 15 times and put your fork down between each bite. with my photographs and not just take a picture. That is part of the passion I now share with seniors. I find it helps unlock memories for them. Life is good! 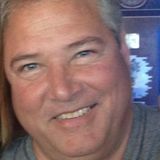 My name is Chris Loraine Wells and I do nature and travel presentations from places all over the world at senior living facilities in Colorado, Arizona and Florida. I am a senior woman (68 years young), and close to the age of the people I present to. I am lucky. I got a calling to marry my love of nature and travel with a late-in-life passion for photography (I started at age 60). I began to brainstorm creative ways in which I could share these loves. I thought maybe I could help excite seniors enough to get them to venture out and explore some of nature’s gifts that were nearby (initially I was in Colorado). That led me to inquiring at Senior Living facilities to see if they would be interested in my doing a National Parks presentation. I explained that I would be using my photos and my stories to bring presentations to life. My intent was to take these seniors to a good place, a memory of a time when they were younger. It was a hit. and reserved although part of it might have been that she was rather shy,” she said. “Joan was very friendly and would invite me back to her dressing room. She had a passable voice, but they really wanted someone to provide a more professional edge.” Despite the obvious vocal talents of both singers who spent many years working in other areas of the entertainment industry, they were dedicated to raising their families. “I never really promoted myself as much as I could have,” admitted Warren. “But I have never, ever felt any regrets about not becoming a better-known singer. I was the happiest woman in the world raising a family.” “I always wanted to become a really big star,” added Adams, “but don’t believe it would have allowed me to have the fulfilling family life that I had. I’m content to be a little star!” Nick Thomas teaches at Auburn University at Montgomery, and has written features, columns, and interviews for over 700 newspapers and magazines. What could be the cause? While the exact cause of IBS-D is unknown, and people may have IBS for more than one reason, an imbalance in the usual numbers and proportions of normally healthy bacteria in the digestive system (the gut microbiota) has been found in many people with IBS-D. The microbiota help digest and absorb food and work with the immune system as a barrier against other microorganisms that can cause disease. “One study of 109 patients with IBS showed that 73 percent had an imbalance in their gut microbiota, compared with only 16 percent of healthy people,” says Dr. Franklin. “Other potential reasons may include previous gastrointestinal infection or food poisoning, communication problems between the brain and digestive system, a family history of IBS and other causes.” Treatment options There is currently no cure, but there are treatments that can help with the symptoms of IBS-D. Lifestyle changes, such as eliminating certain foods and increasing exercise, could help. “Studies have shown that between 50 and 70 percent of patients failed to respond to either fiber or antispasmodics as a treatment therapy,” says Dr. Franklin. “There are different types of prescription treatments for IBS-D. If one isn’t working, it’s important that patients ask their healthcare professional about trying a d i f - ferent medicine to find what treatment is right for them.” For more information, visit IBSDUpClose.com. If you’re experiencing symptoms of IBS-D, don’t be afraid to talk to your doctor about all of them. This is the first step toward helping find a treatment plan and getting relief. GET YOUR MEDICAL MARIJUANA CARD NOW FAST & EASY! CALL FOR FREE EVALUATION BY PHONE Don’t be misled about the medical marijuana program from people that do not know what they are talking about. CALL US! Thousands of Floridians choose us to be their Medical Marijuana Doctor for good reason. Call now! Find out why and how. 7. Talk with your doctor about tobacco and nicotine use and quit. Declare your home and car smoke-free to eliminate exposure to secondhand smoke. 8. Pain medication is personal. If you are taking prescription opioids, follow your doctor’s instructions, store them safely to prevent diversion or misuse, and properly dispose of any leftover medication. 9. Make sure your family is up-to-date on their vaccines. Keep your family's vaccines up to date, including the annual influenza vaccine for everyone age six months or older. 10. Manage stress. A good diet and daily exercise are key ingredients to maintaining and improving your mental health, but don’t hesitate to ask for help from a friend or mental health professional when you need it. The lifestyle choices you make now will have long-lasting impacts. So, prioritize your longterm health by forming great habits. and you must pass a written test and a skills validation to receive a new card. March 4, 5 - 8 p.m. ER Conference Room Registration and pre-payment required - $55: includes book and card Call 1-855-269-4777 Support Groups • Aphasia Support Group Aphasia is a language disorder caused by damage in a specific area of the brain that controls language expression and comprehension, and leaves a person unable to communicate effectively with others. If you and/or a loved one has aphasia, this support group can help. Held the last Thursday of each month. March 28, 3 – 4 p.m. ER Conference Room Registration not required but appreciated. Free. Call (813) 707-2123. • Weight Loss Surgery Support Group Our complimentary support group meetings are exclusive to our BayCare Weight Loss Surgery patients; combined pre- and post-op surgery. Facilitated by our team of registered dietitians, behavioral health specialists and fitness educators, topics of discussion often highlight patient success stories, behavior changes, new recipes, problem solving and tips for staying or getting back on track. Held the fourth Thursday of each month. March 28, 6 – 7 p.m. Swindle Medical Arts Center, Building B Conference Room 1601 W. Timberland Dr., Plant City FL 33566 Registration not required but appreciated. Free. Call (813) 707-2152. The Spring concerts of the Tampa Bay Symphony, under Music Director and Conductor Mark Sforzini, will be Sunday, April 28, at 2:30 p.m. at the St. Petersburg College Arts Auditorium in Clearwater; Tuesday, April 30, 8 p.m. at the Palladium in St. Petersburg; and Sunday, May 5, at 2:30 p.m.in Ferguson Hall at the Straz Center in Tampa. Tickets are $20 for adults and free for students, who must show student ID if they are 18 or over. The orchestra will play Symphony No. 2 by Jean Sibelius. It has been called “The Patriotic Symphony” by the Finns. The winner of the Jack Heller Young Artist Competition, Bailey Michelle Collins, will play Piano Concerto in F by George Gershwin, and the orchestra will play the second annual Composition Competition winner, “Waking Up Down at the Bottom of the Sea,” by Alejandro Rutty, a professor at the University of North Carolina. The Tampa Bay Symphony, celebrating its 32nd season, has more than 80 classically- trained volunteer players, many of them music teachers. For additional information, please visit the website: www.TampaBaySymphony.com. Tampa Bay Symphony (727) 827-8087, P.O. Box 4653, Clearwater FL 33758. Mark Sforzini, Music Director and Conductor. STOP YOUR FOOT PAIN! FOOT PAIN RELIEF WITH A GENTLE TOUCH BY BOARD CERTIFIED FOOT SPECIALIST! Our expert Podiatrists quickly and effectively help you with your foot pain; FOOT, ANKLE, TOE AND TOENAIL Now Featuring: Prosthetic Nails - making ugly nails beautiful in one treatment. Offering you and your loved ones: Diabetic Foot Exams, Custom Orthotics, Braces and not so ugly Orthopedic Shoes. If you experience, Joint problems: Ankle Sprains, Bunions, Crooked Bent Toes, Arthritis or Gout, we can help you. If you have skin or nail problems: Athlete’s Foot, Thick, Ugly or Discolored Nails, Dry Cracked Heels or Warts or other ugly spots, we can help you. Achilles’ Tendon, Heel, Arch or Ball of your foot Pain; we can help you. Burning, Numbness or Tingling, we can help minimize your awful symptoms. Walking Problems; Unsteady Gait or Balance, please call us so, we can help you! With any problem we get you out of pain as soon as possible and then work on the root of your problem! For Quick Effective Relief of Your Foot Pain — CALL NOW! ing antics with his teammates. However, “Generals” isn’t just memories of a time of irresponsibility and crazy exploits. It details Brian’s first meeting with his future wife, the instant chemistry they shared and the growth of their relationship. Brian relays why these times represented a critical turning point in his life. He states that “life is a series of choices, and, whether you are right or wrong, you’re left with the results.” Like Brian’s previous books, “Generals” is an easy read. His books are short, but contain a plethora of emotions. Brian entertains the reader with stories of his freshman adolescent misadventures, but also touches the audience with the tale of his romance with his wife of now fifty years! All four of Brian’s books are available for purchase at Barnes and Noble and Amazon. They are also also available for check out in all the local libraries. He is currently busy with book talks at libraries, fairs, book store signings, etc. He has even made an audio book of his first book Check out the “Headstone” Facebook page to view upcoming book signings and talks and to see pictures of Brian’s past events! This new year vision, I have knitted from hidden purple strands buried below the fragrant blossoms of a childhood tree I dreamed like a row of Fir trees, from a nursery fable of great desire and daylight. I began to write poetry when I was 10 years old. I continue to write new poems as I turn 75. The Sicilian Tenors provide an evening of non-stop entertainment. The Sicilian Tenors brings together three marvelous Tenor voices, Aaron Caruso, Elio Scaccio, and Sam Vitale, singing their own interpretations of the world’s best music. Single Tickets are $35, $25, and $18. JIMMY WEBB-GLEN CAMPBELL YEARS Thu, Mar 28 at 8:00 PM @ Capitol Theatre Chart-topping songwriter Jimmy Webb comes to Clearwater to celebrate The Glen Campbell Years at his Capitol Theatre debut! This show highlights some of the 100+ recordings from the Webb/Campbell songbook, pulling the audience in with various accounts each night of the personal side of generational touchstones like Honey Come Back, By the Time I Get to Phoenix, Wichita Lineman, Galveston and more from decades of shared musical memories.Webb’s moving and often humorous account through performance and anecdotes punctuated with photos, video and audio clips, is a very personal music event that celebrates the legacy he created with his friend Glen Campbell. Jimmy has had chart-topping hits in a unique range of genres over the last 50 years, from country to pop to disco, with songs including Worst That Could Happen, The Highway Man, Up, Up and Away and MacArthur Park. But perhaps the most enduring partnership out of all those memorable songs is his musical brotherhood with Glen Campbell. Tickets are $55, $45, & $29. Performance is at the Capitol Theatre, 405 Cleveland St, Downtown Clearwater. The Capitol Theatre has joined with the renowned Clear Sky on Cleveland to offer a delicious premium dining and entertainment experience for $135. BLAST FRIDAY: THE RIPPINGTONS Fri, Mar 29 at 5:30 PM @ REH On The Road Grammy-nominated contemporary jazz group The Rippingtons return to Clearwater for their Blast Friday debut! Founded by guitarist and composer Russ Freeman in 1985, the group has passed the thirty year mark, and continues to innovate. Under Freeman's production, the group has released 22 albums, all of which have attained top 5 Billboard status, with 5 of them reaching #1. Jazziz magazine called their debut album, Moonlighting, "the number one most influential contemporary jazz album of all time." Special guests Gloria West & The Gents to open the show. A limited number of SUPER VIP packages for all Blast Friday concerts, priced at $49 are available, which includes a ticket with seats in the first three rows of reserved general admission seating directly in front of the Tampa Bay Times Stage, a meet and greet opportunity with band members and two complimentary beers or wine and access to super VIP tent, which includes snacks. An email will be sent with details for the time of the meet & greet 1-2 days prior to show. If you haven't received an email by the day prior to show, please call the ticket office at 727-791-7400, as we can't be responsible for spam blockers or incorrect email addresses. In addition, a limited number of VIP packages for all Blast Friday concerts, priced at $29 are also available, which includes a general admission ticket in the reserved seating section directly in front of the Tampa Bay Times Stage and two complimentary beers or wine. Blast Friday returns to the Cleveland Street District in Downtown Clearwater for its 9th season, presented by West CMR. Food trucks and vendors will be serving a wide variety of freshly prepared specialty food and beer, wine and non-alcoholic beverages that will be available for purchase. Concert goers are welcome to bring their lawn chairs to watch the concert. Ballroom dancer, 70, slim, healthy, very active and young looking, God-directed days, varied interests. ISO experienced dancer for learning more and dancing pleasure. LTR desired, let’s enjoy life together. Clearwater, (727) 712-1906. DWM Questing free spirit, naturist, loves animals, walks in the park, classical music, comedies, candlelight dinners, ISO friend to enjoy all this with. St. Petersburg, (727) 384-4908. FRIEND SEEKING FRIEND Hola, WF NS ND, mid-60s, hoping to find a nice lady friend to go shopping, out to eat, church, go places. My kids are all gone, it gets lonely. Please be in Tampa area. (813) 802-5640. Looking for male friend to spend time with. I’m very outgoing, enjoy the beach, dining out, movies and fun times. Madeira Beach, (727) 798-2438. Hello, I’m 54, BM in good shape looking for a friendship with WM in good shape, NS, ND and no drugs. I like to talk and have fun. Tarpon Springs, (727) 6231738. ____________________________________________________ ____________________________________________________ Phone:______________________________________________ First & Last Name:____________________________________ City:________________________________________________ To the Seeker: Your name will not be published, only your phone number or P.O. Box. A new form must be sent each month for the ad to continue. The publisher reserves the right to edit all material. Senior Voice America makes no promises and bears no responsibility for results or non-results. Fraudulent or unauthorized entries are a Federal offense. Submissions are accepted on a first-come basis, until page is full. Unused submissions will be carried over to the following month. Coupons must be received by the 10th of the month. (StatePoint) Many Americans have a certain vision for their financial future but not a clear path for how to achieve their goals. Use these tips to tackle your finances with greater confidence. • Set a specific goal. Setting goals may actually boost your confidence about achieving them. In fact, those who set a financial goal for themselves in 2017 were more likely to feel that their finances had improved over the course of the year, compared to those with no financial goal, according to research from Lincoln Financial Group. Whether it’s saving more for retirement or paying off a debt, setting a goal is a great place to start. • Make a plan. Having a financial plan in place can help you prepare for life’s surprises and face them with confidence. A financial plan doesn’t need to be complicated, but it should cover everything that’s important to you at this specific stage of your life. A financial advisor can provide an objective voice to help you stay focused on your goals while balancing your risk preferences and time horizon. They can also provide education to help determine if and when to fine-tune your plan. If you already have a relationship with an advisor, schedule time to review your plan and make any necessary adjustments. • Consider sources of protected lifetime income. Eighty-two percent of preretirees are concerned about what will happen to their investments if the market drops. Build diversity into your retirement income plan by incorporating different sources of lifetime income in addition to Social Security. Do you have a pension? Have you considered incorporating an annuity as a portion of your plan? • Strategize taxes. Recent changes in tax laws have some concerned about how taxes will impact their finances and retirement income this year. Discuss tax-smart strategies with your advisor to help increase your income and keep you on the right track. More information, tips and resources can be found by visiting www.lincolnfinancial.com. For financial success, stay focused on your goals and don’t work without a plan. Also, consider consulting an expert who can provide financial and tax advice, and can help you strategize ways to be successful..